Once upon a time, uniformed men driving delivery trucks went door to door through neighborhoods offering goods and services such as milk, vegetables, coffee, knife sharpening and baked goods. 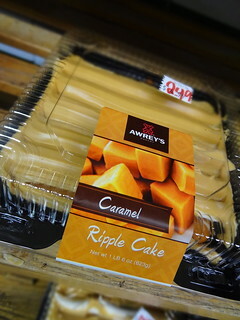 Though he was just a young boy at the time, Kris has vivid memories of the Awrey’s Bakery man coming to their house on Coplin, carrying his treasure chest of sweet treats. 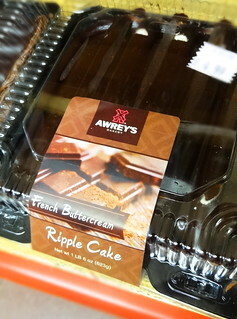 In 1910 the Awrey family began selling baked goods in their Detroit neighborhood, their first store was on Tireman. 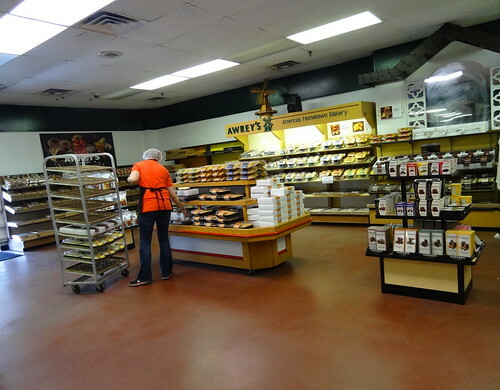 The family business continued to grow through the decades becoming one of the largest privately owned bakeries in the United States. The company was sold in 2005 with family members still working for the company. 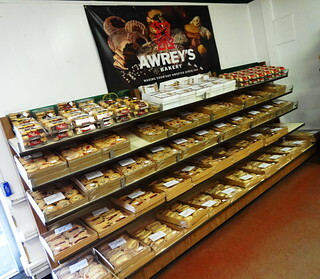 Financial troubles arose in 2012, Awrey’s was headed for the auction block when Jim McColgan of Minnie Marie Bakers stepped in and purchased the company. 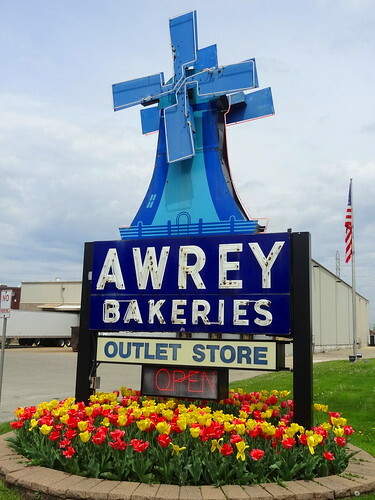 Today Awrey’s Bakery is alive and well, America’s Hometown Bakery lives on. 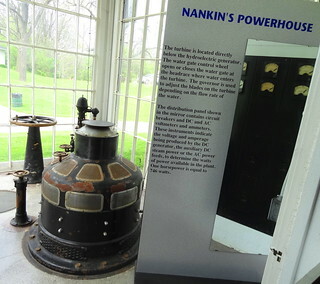 Next stop, Nankin Mills in Westland. 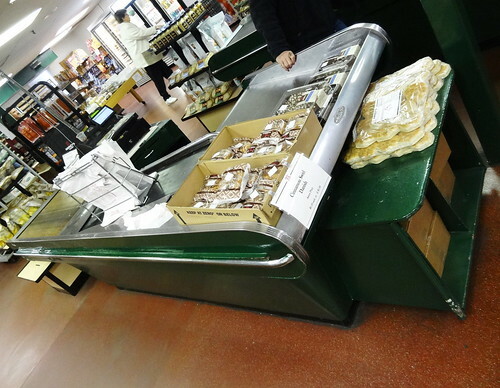 This is one of those historic places that has undergone many incarnations over the years. 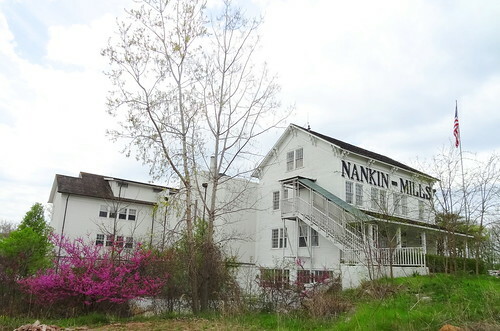 The 2 1/2 story Greek Revival building was constructed as a gristmill in 1863. 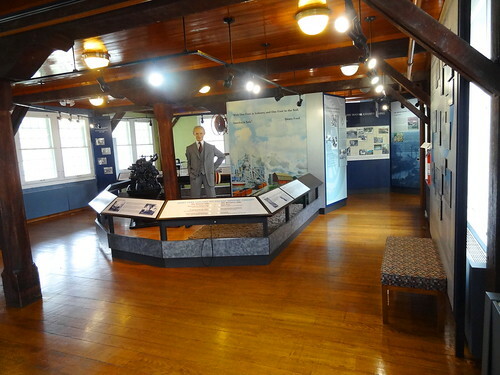 In 1918 Henry Ford came along and purchased the mill as part of his Village Industries. He converted the building to a small factory, employing 12 workers, producing screws for Ford. 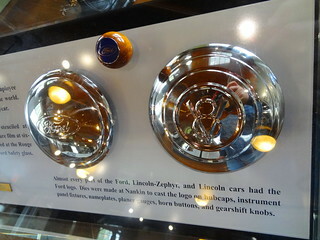 In 1927 the mill employed 70 people as they changed over to produce dies that cast the infamous Ford logo that appeared on hub caps, instrument panels, horn buttons and gear-shift knobs. The factory closed after WWII. 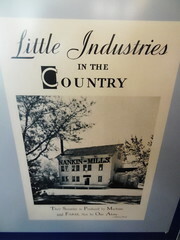 In 1948 Ford donated the site to the Wayne County Road Commission, which remodeled the mill and opened as a nature center in 1956. 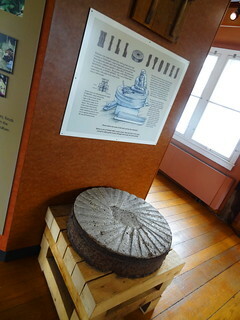 In 2001 the original mill opened as an interpretive center demonstrating the changing face of the mill and the area’s cultural and natural history. 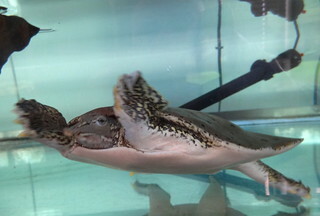 Exhibits follow tribes of Native Americans that canoed the Rouge River, aquariums hold turtles and tortoises as placards explain the area’s eco-system. 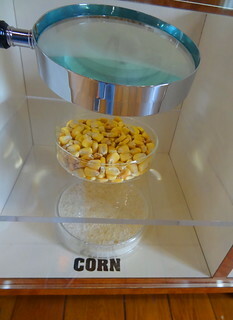 We follow the mill through its gristmill days spanning 1819-1918, equipment takes us through the steps of taking wheat, corn, rye and buckwheat from grain to flour. Antique machinery and samples of items made for Ford accompany videos of workers sharing their memories. Its small, but still a fascinating place. 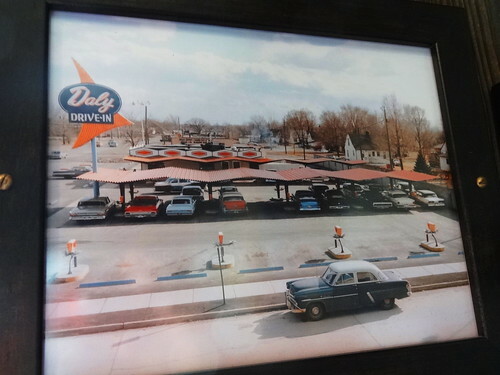 For lunch we stop at the Daly Drive-In on Plymouth Road, it’s been here since 1959, the original drive-in is still in operation. 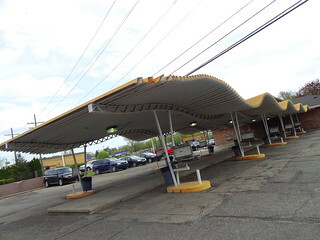 The yellow corrugated roof extends in waves over parking places complete with speakers. Inside we’re seated in a booth, a red and white checkered cloth covers the table, the menu still sports the retro blue and orange boomerang-shaped logo. 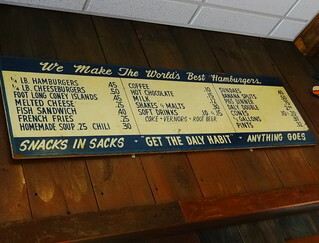 We get the Dalyburger Plate: a 1/4 lb burger smothered in Daly sauce, with fries and slaw. 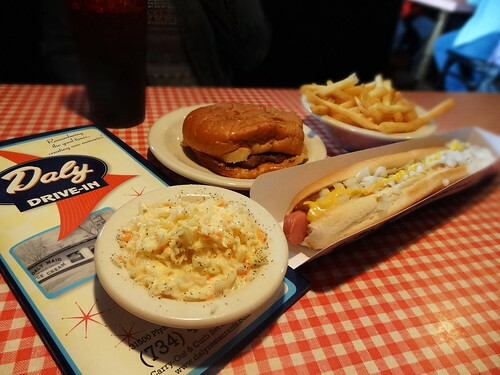 The DalyDog is a 1/4 lb footlong drenched in spicy coney island sauce, mustard and diced onions, served in the same cardboard sleeve they’ve been using since 1948. 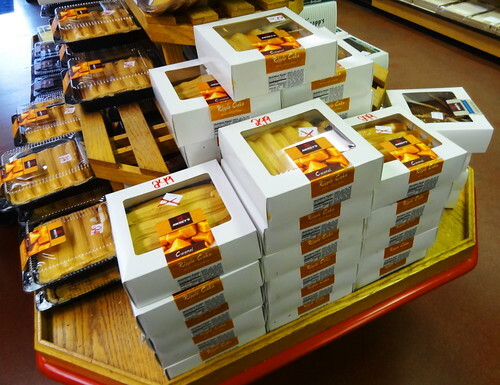 Simple food served with a side of nostalgia. The Custard Hut has been on W Warren in Dearborn Hts since 1979, this is our first visit. 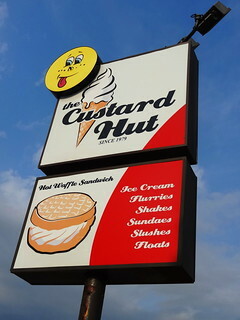 This frozen custard and ice cream shop is known for one particular item, the Famous Hot Waffle Sandwich. We step inside, the only decision we need to make is what flavor frozen custard we want, the two flavors of the day are toasted coconut and pistachio (chocolate and vanilla are always available), easy, make it a twist. 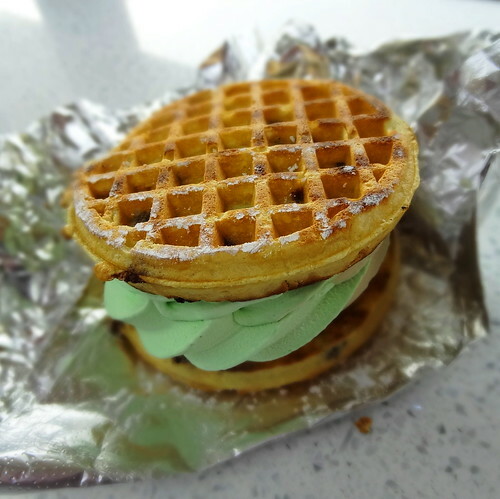 The girl behind the counter disappears, she reappears holding 2 steaming chocolate chip waffles, she carefully swirls the coconut/pistachio custard on one waffle, tops it off with the other, sandwich style, wraps it in foil and hands it over. 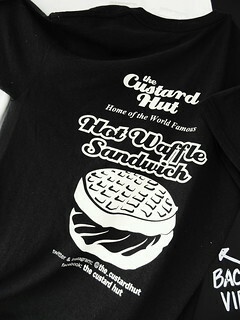 The waffle is warm and tender, easy to bite through getting a satisfying mix of custard and waffle, yum! A steady stream of patrons come and go as we eat, it seems the waffle sandwich has a loyal following, I can totally see why. It’s been another great day visiting businesses and places that have stood the test of time.